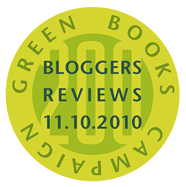 Last year on November 11 Eco-Libris asked 100 bloggers to review 100 different books that were printed on recycled paper or paper certified by the foundation-funded Forest Steward Council (http://www.fscus.org/paper/), and post them on their own websites. This year they were at it again and have doubled the number, with 200 bloggers posting their reviews throughout the day. Canada’s Indigo Books is this year’s primary sponsor.. In a profile of the project published here last year, Eco-Libris CEO Raz (pronounced Rahz) Godelnik told our reporter Sharon Greenberg, “I love books,” Godelnik says. “My mother is a librarian. I grew up in a house full of books. I think both books and trees are wonderful assets. It’s not fair that one should happen at the expense of the other.” Godelnik noted that while newspapers had for some time been using some percentage of recycled stock, books were a kind of virgin sacrifice—they relied on new paper. The project’s Web site claims that 30 million trees are cut down each year to supply the paper used in books “deforestation accounts for an estimated 20% of global carbon emissions, more than the emissions from the transportation, aviation and IT industries combined.” If books could be “grown” the way organic food was grown, he thought, a new business model could be born. The result was Eco-Libris, a for-profit green branding and marketing company, that asks consumers to “balance out” their books’ environmental costs by paying $1 per book bought to plant a tree in Africa or Central America where trees can offer economic as well as environmental benefit. Through its various programs, Eco-libris has been able to plant more than 120,000 trees since the company was launched in 2007.